2017-05-16. The owner of Secured Options and Inside Option has been arrested. Charges include aggravated fraud, misrepresentation, false accounting, forgery, extortion and blackmail. CLICK HERE to confirm. The FPA considers this to be sufficient evidence to confirm that both companies are scams. Website is down. One less scam company in business. 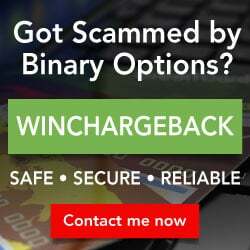 InsideOption accepts funds by card but tries to service a withdraw by wire transfer. No bank details are ever requested. They demand for card transfer $100 min in account and for wire transfer $500. Then when the $50 bonus is added they require 25x[initial deposit + bonus] to be in the account. These outrageous conditions in their T&C are reasons for avoiding this broker altogether.